Since 2007 we are collecting seeds of tropical fruits and the classical vegetables in order to offer them for free to development projects on different continents. This initiative soon became a huge success, many “sponsors of seeds” understanding that this is a very simple and practical way to help undernourished people to fresh food, in particular the rural people in the drylands. Nowadays, seeds are sent from all over the world to my personal address in Belgium, where we select the species which would adapt to particular climates and then send them to development projects in Asia, Africa and South America (see www.seedsforfood.org). It is interesting to see that a number of people have questions concerning the possible invasive nature of some vegetables or fruits. To the best of my knowledge there are no invasive vegetables. And if there are, I would like to know them. My logic says : if one or another “foreign” vegetable invades a new area where it is cultivated, no harm would be done because more vegetables would mean more food. Would people really mind such an invasive vegetable to spread easily, in particular the rural people in the drylands ? Suppose a variety of tomato, parsley, onion, beetroot, carrot, orange, lemon, avocado, papaya, etc. would invade a desertlike area or a rural area in a Sahel country. Would people really mind ? Would such a variety be an ecological catastrophe or would the local population appreciate the proliferation of that new kind of “free fresh food”. I would like to know the views of other people about this “problem”. “My name is Adam Stuart, and I will be living abroad in Malawi, Africa for a number of years. I came upon your website or blog describing container gardening while I was searching to determine what seeds might be best to bring for gardening that would not be harmful to Malawian ecology. It appeared from my preview of your work that perhaps you might have some insight into what vegetables may not be good candidates. I’m hoping that you may be able to shed some light on the subject, and hope it is alright to contact you in this regard. As an example, I am a huge fan of tomatoes. Having grown tomatoes in my own garden, however, I recognize that tomatoes are most likely to reproduce year after year; although, I haven’t found that they are likely to spread easily. If I may ask, what is your opinion on this matter? Would tomatoes be an invasive species in Africa? Are there specific tomato species that might be safer than others? Of course, I’m also interested in knowing what species would be ideal and/or not ideal for gardening in Africa. I don’t want to be responsible for introducing invasive species when I’ll be living in Malawi to help develop sustainable economic practices that help protect natural resources instead of degrade them. Thank you for taking the time to read my email. I understand you are likely to be busy, so I appreciate what assistance you may be able to provide. Good to hear that you will be living in Malawi for a certain time, where my good friend Patrick HARRY is promoting container gardening since 2007. It would be good if you contact him over email (see his address). To the best of my knowledge there are no invasive vegetables. Even if one or another species would invade a certain area, it would be excellent for people and animals (getting more food that way). I am sure people would not mind at all and harvest that species for their own benefit. It is difficult to say which are the best species for Africa. All depends upon the climate. But seemingly the seeds of melons and pumpkins I gave to Patrick did wonderfully well. I would rather try different species and see what is going best (Trial and Error) . Seeds not germinating are still a contribution to the organic content of the soil. So, no harm done. “I was reading very carefully your e-mail on the topic of introducing new seeds in Africa. 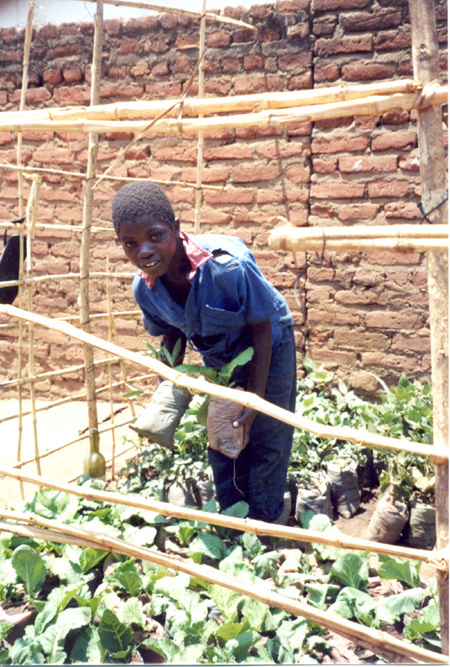 It is of great interest to hear people like Stuart having interest to stay in Malawi and try to help in the development of Container Gardening. Tomatoes, which he said he grow in his garden, can also do well in Malawi despite the difference in climate. However it depends on the species. The melons and pumpkins seeds, which you offered me as a gift when I was in Belgium in 2007, are good examples of seeds which are introduced from Europe to Africa. They do well despite the difference in climate. Those seeds, even if they were newly introduced, survived the warm climate of Malawi and finally healthy fruits were produced. This was a significant success through container gardening. 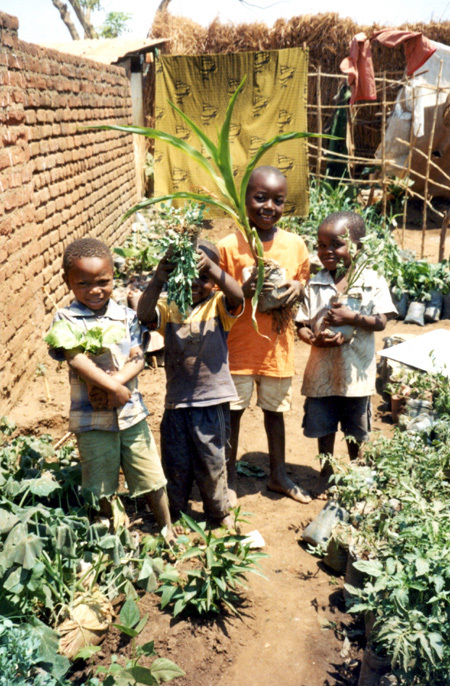 2009 - Malawi container gardening project : look what the seeds we were collecting did for these kids. Let us multiplicate such initiatives like container gardening and school gardening for the benefit of all those hungry kids in the world. Ladies and Gentlemen at the decison-level of the international scene, this green ball is laying in your camp ! I am therefore encouraging Stuart to bring with him a lot of vegetables and some tree species from Europe, which can be introduced in Malawi through container gardening. I am ready to meet him and he is welcome to contribute to the project for the better of the people of Malawi, so that hunger, poverty and desertification can be combated all together through container gardening. NOTE: The e-mail address for container gardening project is containergardeningmw@yahoo.com. What a pleasure to hear that melon and pumpkin did so well in Malawi. Our sincere thanks go to all our sponsors of seeds. Can you imagine that eating a melon or a pumpkin in Europe, Canada, the USA or Australia, saving the seeds instead of throwing them in the garbage bin or on the compost heap, is helping a number of kids in Malawi to juicy fruits or a tasty pumpkin soup ? Do I hear more critics on our action “Seeds for Food” ? Invasive species ? Not in Malawi ! No where !